Ivy is a seven-year-old domestic long hair, who is a total cuddle bug! 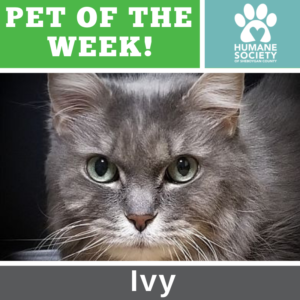 If you want a cat that is extremely affectionate, then Ivy is your girl! She will creep right into your lap and never want to leave. Being cuddled and held is what really makes her happy. Ivy will let you know she loves your attention by purring at you the whole time. Because of her extended length of stay, Ivy is part of our current Adoption Special. This means her adoption fee is waived ($0). Find out more about Ivy here.